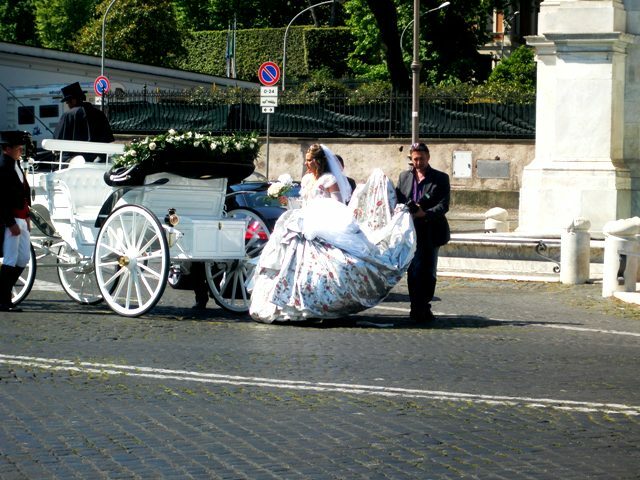 Italian wedding tradition is among the oldest in the world, dating back to Roman traditions. Many of the traditions are still in practice. In ancient time, man request a women hand from his father, this is still in practice in some parts of southern Italy but now a man directly proses a women. In southern Italy engagement is in form of a party among friend and relatives but, this is not practiced in northern Italy. On the wedding day bride has to wear some thing blue, some thing old, something borrowed and something new. It is believed that this will bring her good luck. Groom wears dark grey thin socks,cuff links, boutonniere, a tail cot including a silk top hat and gloves. Wedding takes place in a church. Church is often decorated with ribbons to symbolise the marriage bond. Bride is the first person to enter the church so, all relatives and friends wait outside the church for bride and groom. Groom arrive in advance but wait and enters the church few minutes before the ceremony. Bride’s family sits on left side and groom’s family on the right side of the church. Father of bride take bride and give her away to the bride, and then come back and sit. Then groom unveil bride and then rings are exchanged. When the couple exit church, rice is showered on them as a sign of good luck. In southern Italy, reception is bigger,longer and showier, whereas in Northern Italy its more intimate and less showy. An Italian wedding reception include an elaborate meal lasting four hours or longer, and may involve up to fourteen individual courses. One of the final courses is the wedding cake, or zuppa inglese, which is a traditional Italian confection of tiers of pound cake filled with chocolate or vanilla custard, rum cream, and fruit, and trimmed with icing shaped like flowers. Bride throw away her bouquet on unmarried ladies and is believed that one who catches it will get married next. Another incident is the “cutting” of the groom’s tie into small pieces, then a guest – usually a friend of the spouses – walks between the tables offering the guests a piece of it and gets some money back that, in the end, will be given to the wedding couple. Dancing is an integral part of any wedding celebration, and no Italian wedding would be complete without the traditional tarantella dance. At last they give bomboniera to all the guest attending the wedding, as a sign of love, thanking, souvenirs for taking part in the wedding.